It's not time to put away the gardening tools just yet. The cooler weather is on the horizon and the leaves will be falling soon, if you live in the northern part of the U.S. that is. This is a great time to begin working on garden maintenance to ensure your spring crop will be a healthy one. A good guide to follow is the falling temperatures. When the temperature falls below 40 degrees at night or there is a forecast for a frost, this is the time to begin your preparation. This is also a good time to decide which plants you will keep for next year and which to let go, those that did not do so well during the summer growing season. Some plants that will do well being planted in the fall are Brussels Sprouts, Endive, Escarole, Coneflower, Hydrangea, and Asters. Once you have finished cleaning up the garden, rake out any fallen leaves or other debris and pull weeds. Weeds may die when frost hits, but their seeds survive in the soil. So pull all you see and discard them in the compost pile or put them into the landscape waste. Insects and diseases can hide in this debris and be damaging to your garden. Be sure to harvest any left over vegetables and/or annuals that will not tolerate the colder air. It is also a good idea to trim any rotting tree branches that may be hanging over your garden to avoid them dropping on your plants next year. Consider wrapping and supporting any younger trees to help them survive the cold winter winds. Resist pruning trees or shrubs now as this may stimulate tender young growth that will not survive the cold. Wait to prune deciduous trees and shrubs that need shaping until the plants are dormant. Mulch the garden with pine needles, shredded bark or other materials to help protect it from the cold weather. Be sure not to mulch too soon as some insects may survive and take up residence over the winter. 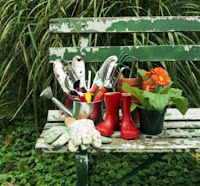 Finally, clean your tools when you have completed your garden clean up and store them in a safe place where they will not rust. Do you have some fall garden tips that are successful for you? Do share them with us. 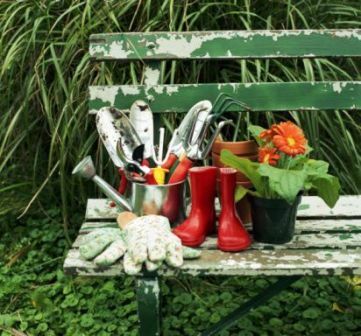 If a new spring garden is in your plans, lay it out now, layer it with compost, newspapers, etc. Come spring, you'll be ready to plant! Beth - this is a great tip, thanks for sharing. A great way to learn how simple it is, watch the film Back to Eden. Check out our previous post to find out where you can watch the film online and read our film review.